Welcome to Luterra Enterprises, home of the Winnow Wizard, Wonder Winder, and other designs and services for small-scale agriculture and homesteading. All designs are open-source and patent-free. Follow the links at left for more information. 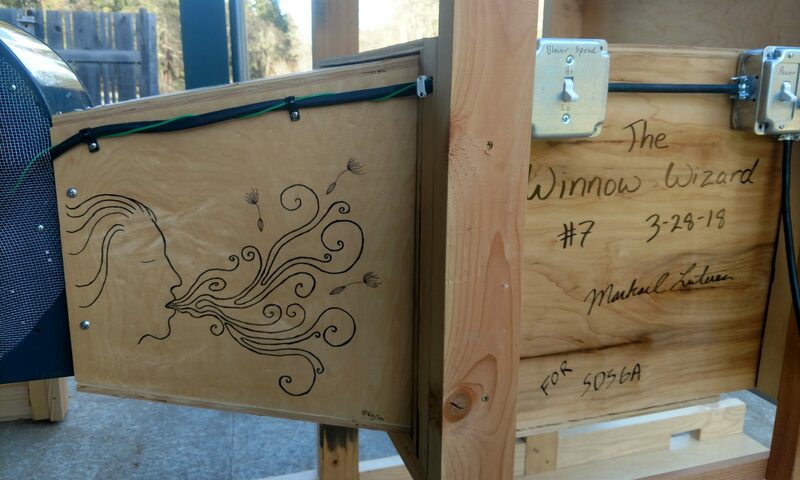 Now in its final form after three seasons of continuing development and use at Wild Garden Seed, the Winnow Wizard is ready for prime time. Designed in response to a need for precise density separations of small seed lots, it has already saved hundreds of hours and many thousands of dollars. 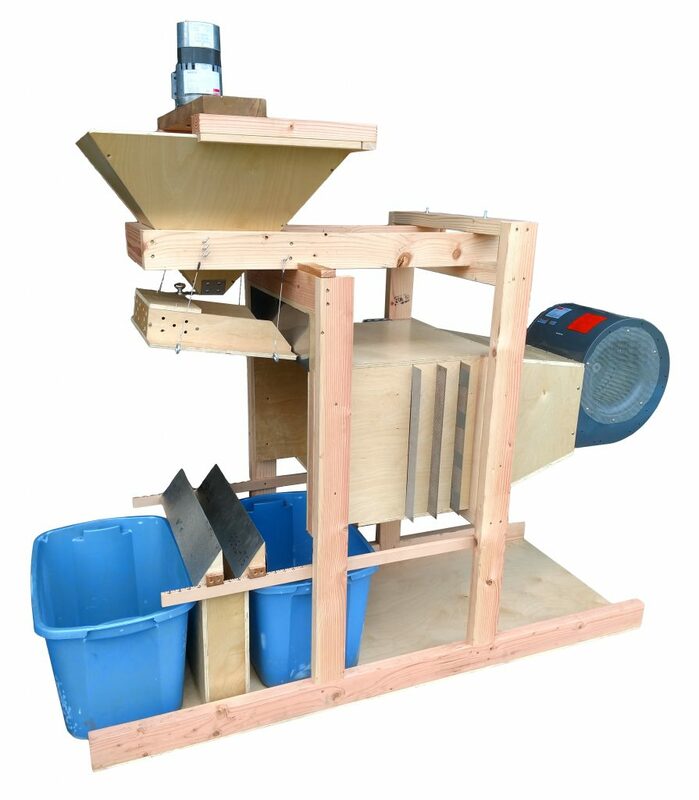 In addition to replacing manual fan winnowing, the Winnow Wizard has effectively removed dead or hollow seed from multiple low-germ lots, enabling sale of previously unsaleable seed. Inspired by the sterile laminar flow hoods in my microbiology background, the Winnow Wizard uses a pressure differential across a series of perforated metal grates to create a steady, even, adjustable flow of air. By changing grates and varying blower speed, airflow can be adjusted from a gentle breeze for tiny yarrow and snapdragon seeds up to a strong wind for brassicas, corn, and beans. In contrast to fanning mills, air separation occurs in a visually open area allowing for continuous monitoring and adjustment during operation and eliminating the potential for seed contamination between lots. As a precision density separator, the Winnow Wizard performs many of the same functions as a gravity table at a fraction of the cost with no minimum lot size, no cleanout time, and simple, intuitive adjustments. Following the model of the Open Source Seed Initiative, this is an open source design. I do not intend to seek a patent, and publication of the plans online legally precludes any other entity from patenting it. Wide adjustable range of wind speeds for seeds of all types. Vibrating feed tray with adjustable angle and slot width for different seed shapes and sizes. Hopper holds up to 12 gallons of seed, with sliding gate for slow-feed, accurate winnowing or fast-feed, rougher winnowing. Hopper support (along with hopper and feed tray) easily removed for manual pouring of very small lots or non-flowing seeds. Seed splitters rest on ruled rails; the optimal setting for each seed type can be dialed in and repeated. Two splitters and narrow bin can split the seed stream into three fractions: good, mixed (for re-winnowing or further processing), and trash. Magnetic hopper gate: $95. Uses powerful rare-earth magnets to deflect dirt and rock particles out of a falling stream of seed. Works best with small seed, and efficacy may vary with magnetic properties of local soil. Hopper agitator: $395. Allows dirty, dusty, or papery seed to feed automatically from the hopper. Very helpful if using the Wizard on seed lots that have not been field-winnowed. Contact me if you are interested, or complete and mail an order form (below). Each Wizard is custom built to order, tested, signed and dated, and adorned with original line art by Wild Garden Seed’s Victor Sauvie. Cost (excluding shipping) is $2185, plus any accessories. If you have a group of seed farms in your area that would like Winnow Wizards, I am available to travel, build on-site, and provide initial training. Contact me if you are interested. Setup, operation, maintenance, and troubleshooting. Detailed descriptions of winnowing techniques to remove chaff, hollow/immature seed, and material heavier than seed. Probability-based techniques for winnowing flat seed. Instructions for hopper agitator and magnetic dirt removal. Overview of the seed cleaning process used at Wild Garden Seed, with complete process descriptions for kale and lettuce seed. Discussion of the advantages and limitations of winnowing, and how best to combine winnowing and screening steps to clean seed efficiently. Listing of useful screen sizes for common vegetable seeds. Table of screens and Winnow Wizard settings across a wide range of seed sizes. Summary of ways in which the Winnow Wizard has streamlined and improved seed cleaning at Wild Garden. Complete and mail to the address on the form. My name is Markael Luterra (I go by Mark). Luterra Enterprises is a portfolio of my designs, ideas, and knowledge that I feel sufficiently confident in to offer to others. I don’t wish to convince you to buy anything you don’t need. Rather, I wish to offer solutions that have worked for employers, clients, and my own endeavors. Suggested improvements are welcome. I have never managed to fit conveniently into a category. As a child in rural southwest Minnesota, my passions cycled between gardening, biology, botany, astronomy, weather, natural history, music, conservation, engineering, and alternative energy. I pursued conservation biology through a BA at Carleton College (2007). As education transitioned to career, I began to feel that I could not value the warblers, the prairie flowers, the seasonal cycles as I wished when assessing them as data points, and the engineering side of me wished to solve problems rather than simply understand them. Following an idea for bio-solar hydrogen production, I completed a Ph.D. in Biological and Ecological Engineering at Oregon State University in 2014. Though my work redesigning the metabolic pathways of cyanobacteria to convert sunlight to hydrogen energy was largely a success from an academic perspective, I began to question the cultural mythology that new technology will bring a shiny future of space travel and unlimited energy. I wasn’t sure that I wished to inhabit that future, even if it were possible. Caught in an artificial world of pipettes, sterile hoods, and centrifuges, growing re-engineered cells under fluorescent lights, I wished to return to working alongside the myriad creations of three billion years of evolution. Since 2014 I have worked for Wild Garden Seed, an organic vegetable and flower seed company driven by the passion and plant-breeding creativity of owners Frank and Karen Morton. Many of the designs offered here were created to solve problems and increase efficiency in the Wild Garden operation. My goal in offering these designs and services is to help build and inhabit sustainable, soul-nourishing communities – communities where seeds, produce, equipment, and the “stuff” of life are supplied not by multinational corporations via big box stores but rather by friends, neighbors, family businesses, and cooperatives. I welcome opportunities to collaborate with others who share this vision. The Winnow Wizard, Wonder Winder, and convertible hot bench/hydronic seed dryer arose from unmet needs at Wild Garden Seed – processes for which existing products were unavailable or unsatisfactory. If you have any such needs on your farm or homestead, feel free to send me a message with some details. I’ll ponder it and reply with some tentative ideas free of charge. If you then would like me to further research, design, or implement one of these ideas, we can arrange compensation for my time and effort.